Wearing the same pair of boxers for the third day in a row, my whole body aching from sleeping in the airport, the 5 euros in my pocket literally the only money I had left, America echoed through my head as I walked through Milan’s airport security. The goosebumps came in floods. After flying from Columbus to London to Italy, I stepped off the plane and into an afternoon my body otherwise believed to be 1:00am. Zach had already arrived at the hostel as I collected my bag, but after taking a bus, asking eight people for directions, and trekking 30 minutes through the rain, I joined him. 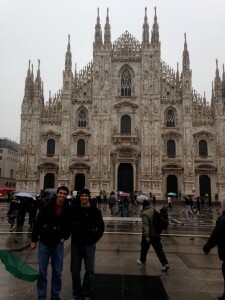 Out in front of Milan’s Duomo–the largest cathedral in the city. I kept imagining our first encounter after being so long apart—bear hugs, laughter, rounds of alcohol and stories. Instead, he rolled over in bed to give me a half-wave, what’s up. Poor little Zachary would be battling jet lag the whole trip. Our first night was mainly spent feeling out Milan (probably our least favorite city in retrospect—it was dirty and full of uppity, high-fashion individuals). However, the second day, we went to some museums, checked out a castle, and most stunningly, saw The Last Supper by Leonardo da Vinci. However, one can only stay divine for so long, and after a final, sinful night of drinking in Milan, we boarded the train to Bologna…only to learn that three hours in a stifling cabin, incredibly dehydrated, with only a mushy apple to appease our thirst, was quite unpleasant. Not the most useful when we had no access to GPS. Nonetheless, we “thunder-gunned” it (i.e. made a brash, impulsive decision praying our luck would prevail) and jumped on bus 36. Only later, however, did we learn that there were two bus 36’s. Oblivious, I stood next to a window calling out street signs (Italy doesn’t have real street signs; they have tiny plaques on building walls—where building walls exist—to denote the street names), while Zach tried to track us on the free, black and white map we had received from a hotel. A map, ten minutes into our bus ride, that no longer began to match the streets we were seeing. So after twenty minutes of realizing that “thunder-gunning” may not have been our most sound decision, we elected to jump off the bus and try to reorient ourselves on foot. Cannot wait for the next episode! You two are so brave!! !